That is what the famous German geologist said. It is quite definite that this Knowledgebase would not exist if rocks were not fractured. We divide rock fractures into four main categories based on their modes of formation, deformation mechanism, and geometry: joints, pressure solution seams, deformation bands, and faults (Figure 1). Another fracture type may have a hybrid character including two of these four major types. Note that while the term, 'fracture,' may refer to any of these features, it is more typically used for joints, and occasionally, for small faults in some geological literature. What follows is a short introduction to each fundamental element. Figure 1. Diagram illustrating the three major fracture types based on their kinematics, i.e., the nature of displacement discontinuity across them: shearing (faults and shear bands), closing (compaction bands and pressure solution seams), and opening (joints, veins, dikes, and dilation bands). From Aydin et al. (2006). 1. 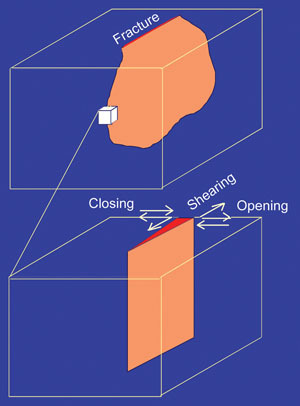 Joints are opening mode (mode-I) fractures which are sharp breaks where the displacement discontinuity (see Figure 2 for definition) is predominantly perpendicular to the plane of parting: The walls defining the fracture move away from each other creating an opening. Displacement discontinuities gradually diminish in some fashion towards the fracture tips before vanishing at the tips. However, for mathematical convenience, displacement discontinuity may also be assumed to be constant along the entire fracture or along short multiple elements defined along fractures in mathematical models. Figure 2. An idealized diagram showing displacements of adjacent points on the two faces of a fracture, the difference of which defines displacement discontinuity. Displacements along each face may be assumed to be positive in the positive coordinate directions. Then, displacement discontinuity normal to the fracture [Dn = Uy(+) - Uy(-)] defines opening if positive and closing if negative. 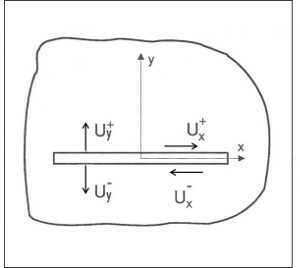 Displacement discontinuity parallel to the fracture [Ds = Ux(+) - Ux(-)] denotes shear displacement discontinuity. From Crouch (1980). If this fracture opening is filled by precipitants, the structure is called a vein, examples of which are provided under 'Joints'. 2. Pressure solution seams or pressure solution bands are closing mode fractures which are thin bands of residue from dissolution under pressure and are sometimes referred to as anti-mode-I fractures, or in short, anti-cracks. They are structures where the displacement discontinuity is predominantly normal to their planes and the boundaries move towards each other with respect to pre-deformation reference planes. This results in a negative displacement discontinuity. To account for a significant degree of volume reduction within the structure, it is sometimes necessary for dissolved material to be taken out of the system in order to facilitate the continuity of the solution process and the volume reduction resulting from it. 3. Deformation bands refer to narrow tabular bands with finite but small widths in which deformation is localized (Figure 1). Deformation bands are classified as dilation, compaction, or shear bands based on the predominant sense of their displacement discontinuity (Figure 2), similar to 1 and 2 above, respectively. 4. Faults, or shear fractures, refer to breaks where the predominant displacement discontinuity is parallel to the planes or zones of breaks (Figure 2). Shear fractures can be further classified as mode-II and mode-III based on the relationship between the fracture front and the nature of shearing component therein and will be discussed later. These are commonly idealized as planar discontinuities with frictional sliding. 5. Hybrid Fractures refer to breaks accommodating displacement discontinuity components both parallel (shear) and normal (opening/closing) to the fracture surfaces. This classification is somewhat different from the one commonly used in engineering fracture mechanics and the rock mechanics literature (to be introduced later), which is based on the displacement or stress components acting along the fracture propagation front. However, while this alternate classification can be very useful in analyzing fractures, or cracks as they are referred to in engineering fields, it is rather restrictive in our context, because in a majority of natural geological structures, especially top-level complex structures, it is often difficult if not impossible to identify the propagation directions and the mechanical conditions at their fronts. The classification adopted here is also different from an entirely kinematically-based classification in the sense that it includes the mechanism of localization and the resulting structure widths, across which certain components of deformation are distributed. For example, a distinction is made between deformation bands, pressure solution bands, and sharp fractures such as joints and slip planes of faults. 1. Single fracture: an isolated single structure that has the basic properties of a particular structure element listed above. 2. Fracture zone: a collection of closely spaced, parallel or sub-parallel structure elements of the same nature. The spacing within the zone is much smaller than that outside the zone. 3. Fracture set: a collection of parallel or sub-parallel fracture type with an identifiable characteristic spacing and distribution. 4. Fracture multiple sets: two or more fracture sets with different orientations, occurring in the same locality, and thus intersecting each other. The intersection angles between the sets and the spacing and distribution of the fracture elements in each set define fracture patterns. 5. Fracture domain: a particular pattern of fracture system with various distribution and geometric parameters, distinct from those in the adjacent areas across a given region. 6. Fracture assemblage: two or more different types of fractures commonly occurring together within a system. For example, pressure solution seams and veins may be associated spatially and temporally within the framework of dissolution under normal stresses, fracturing, and precipitation. At a larger scale, the mid-ocean ridges and transform faults associated with them can be considered as a structural assemblage. The organization of this Knowledgebase is from the bottom upward, from the simplest directly observable class of isolated fracture elements to very complex and obscure assemblages (Kline, 1995). By working backward using links, it is also possible to break down or deconstruct structures with various degrees of complexities into simpler constitutive parts (a top-down approach). In other words, the links listed below may be navigated from top (Fracture Elements) to the bottom (Fracture Assemblages) or vice versa. The only exception to this hierarchical flow in this Knowledgebase is the Fracture Components as pointed out above, because it would not make sense to introduce components before the Fracture Elements themselves. Also included in the Knowledgebase entries are relative time factors, making it possible to use a ladder approach to analysis of deformation. Bottom-up, top-down, ladder, or a combination of the three are all compatible with the skeleton of this Knowledgebase and are convenient in introducing complex hierarchical fracture systems. This approach is also helpful for a systematic cognitive learning process by encouraging one to compare and contrast the facts and images of the corresponding parts of different fracture classes. There are other types of geological structures not included in this Knowledgebase. For example, folds are one of the most important types of geological structures and maybe closely related to fractures, but they are not discussed in this Knowledgebase, except in reference to their relationships to fractures. If the user wishes to expand the Knowledgebase to include another structure which is beyond the scope of the present endeavor, the groundwork for such an expansion is in place. The user can simply copy a section of the database and use it as a template, overlaying the new data, images, or mechanisms over the original ones. Aydin, A., 1996. Physical characteristics of fractures and fracture patterns. In: Rock Fractures and Fluid Flow (Chapter 2). National Academic Press, Washington, D.C., p. 29-101. Aydin, A., Borja, R., Eichhubl, P., 2006. Geological and mathematical framework for failure modes in granular rock. Journal of Structural Geology 28 (1): 83-98. Crouch, S.L., 1980. Analysis of stresses and displacements around underground excavations: an application of the displacement discontinuity method. University of Minnesota Geomechanics report, 268 p.
Engelder, T., 1987. Joints and shear fractures in rock. In: Atkinson, B. K. (Ed.) 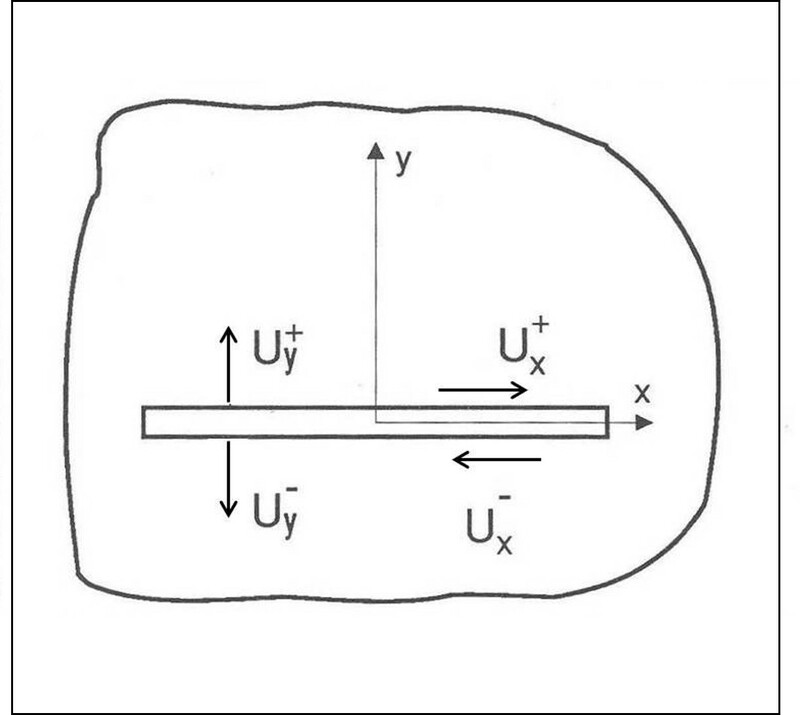 Fracture mechanics of rock, Academic Press, London, p. 27-69. Kline, S.J., 1995. Conceptual foundations for multidisciplinary thinking. Stanford University Press, Stanford, California. 337 p.